Dr Stephen Leach has some thoughts. One person’s influence upon the earth’s environment is necessarily limited but nonetheless crucial. Average yearly temperatures are rising; and, for our species to survive, although our abilities are modest, our ambition must be enormous. None of us can solve the problem of climate change on our own, and our record of solving problems together is not good. In short, it’s a worry – one of the greatest political problems of our time. And, although the problem is as urgent as ever, it already feels as though it has been with us for a very long while. Let us therefore, just for a moment, take a slightly different perspective on the problem by thinking about it in relation to another increasingly urgent problem, the thought of our own individual mortality. Interestingly, these worries do not necessarily compound one another, rather without the aid of religious faith, there may be a way to manage one worry with the help of the other. One human characteristic that may come very close to universality across cultures is respect for the grave. And, insofar as any land is safe from development, the graveyard is a sanctuary, tended with care but set aside from having to turn a profit. But this care can be extended beyond official graveyards. For when we scatter a loved one’s ashes in the countryside there is the same feeling of obligation to look after that patch of ground as there is within a graveyard. My point is very simple: that, when we scatter ashes somewhere beyond the graveyard walls, the care that is traditionally concentrated on graveyards becomes itself more widely scattered. And that is a consoling thought, both politically, with respect to climate change, and personally, with respect to leaving some form of legacy. ‘Well,’ someone might say, ‘when I’m dead, I’m dead. I won’t know anything.’ (I have noticed, by the way, that this often is said with a tone of pride, presumably pride at hard won tough-mindedness.) Well, for the sake of argument let us grant that point, but if you nonetheless have some concern for the fate of the earth, then there is your motivation. What have you to lose? There is a caveat. I have argued that it may be helpful to think of the two problems together, but this suggestion is not a magic bullet for either worry. For example, by asking for one’s ashes to be scattered in a favourite meadow, one cannot in a fail-safe way prevent it from being covered in concrete if it is already scheduled for development. If you try to prevent a particular development taking place – if you request that your ashes be scattered on a site already scheduled for development – then you are very likely to cause your friends and family distress when the site is bulldozed. Of course, there is no guarantee that this will never happen wherever your ashes are scattered. But, that notwithstanding, it is also true that if it is cared for a hedgerow or a wood can, like the earth itself, in principle last – from most of our perspectives – almost for ever (until the sun burns out, etc. ), every part continually renewed. 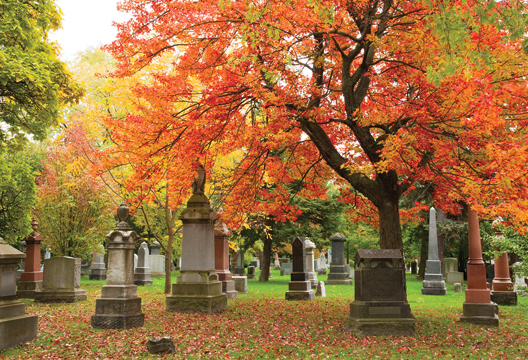 Scattering ashes beyond the graveyard encourages this care. In the other direction, it would be surprising if the thought of still doing some good after one’s death were to quell our awe of death entirely; but, nonetheless, it is curious that these two different worries do not compound each other. In both directions, we can feel less helpless in the face of one worry by also thinking of the other. Neither worry is eradicated but – logically, pragmatically and psychologically – both worries may grow somewhat more manageable when we think of them together.